Dozens of people are missing after a boat carrying refugees from ethnic conflict in western Burma (Myanmar) sank in the Bay of Bengal. About 70 Muslims from the Rohingya minority, including women and children, were aboard, police in Burma said. 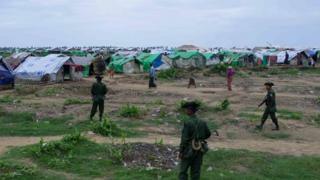 They are thought to have left a camp around the Rakhine state capital. Aid agencies have warned of a growing exodus of Rohingyas, who have been displaced by communal violence, attempting the dangerous sea journey. The boat was thought to be bound for Malaysia, where thousands of Rohingyas have sought sanctuary since violent clashes with Buddhists erupted last year. Over the past two years, hundreds of thousands of minority Muslims have been forced to flee Burma. Many Rohingya Muslims are living in tents or temporary camps. Aid agencies say the relentlessly grim conditions will push record numbers out to sea, in flimsy boats, where they are very vulnerable to bad weather, engine failure, or being sold by people-traffickers in Thailand. The United Nations said on Friday that more than 1,500 people have tried to leave by boat in the past week. The BBC's Jonathan Head in Bangkok says Burmese authorities have done little to improve the situation of the Rohingyas, despite repeated international appeals. They are still subjected to forced segregation, denied access to schools and hospitals, and barred from travelling or having more than two children without permission, our correspondent says. Rohingyas, whom the UN describes as a persecuted religious and linguistic minority from western Burma, are not recognised as Burmese citizens.